The Collected Interior: Mood Board Design, and a throw pillow Switcheroo! Mood Board Design, and a throw pillow Switcheroo! Hey guys, today I thought I'd share my latest Mood Board Design. 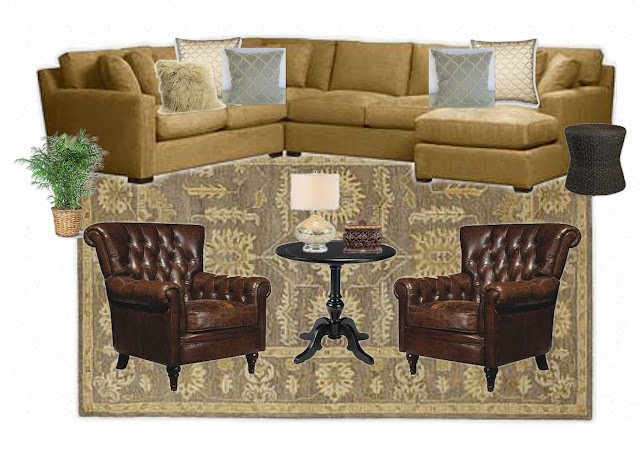 A client of mine has a similar sectional below with gold/tan, maroon and hunter green throw pillows and she was looking to update her Family Room. So we ditched those old pillows that originally came with the sofa, and ordered new custom pillows in cooler colors of gray-blues and creams. We also introduced a few new patterns into the space for added texture and interest. Then we added the Mongolian Lamb Pillow from West Elm for even more texture and a pop of chic! It's such a simple change, but adding new throw pillows (and other accessories) can instantly update a space without having to buy new furniture. So agree, I've been eyeing that Lamb pillow for a while now too! Yes, this is why I tend to prefer neutral colors for paint and furniture in the main rooms of my house. It is so much easier and cheaper to change things out for an instant update! I love the pillow! This is my design philosophy too. As much as I love color, neutral furnishings are the way to go! And then you can add color with pillows and accessories. The lamp pillow really takes the couch to the next level and it is super eye catching. I am sure my dogs would be fighting over it.